There are experts in certain fields that are sought after for their expertise— and they are quite expensive to secure. So when you get them, you make the most of their presence. This is what we made happen at Merck. A Customer Focus guru was brought in to go over the concepts and principles, as well as provide many enlightening stories. And he did so over the course of a long day when two different departments sat down with him in our E-Learning studio. We set up for this shoot several weeks ahead of time by getting special banners to dress the otherwise bare set. 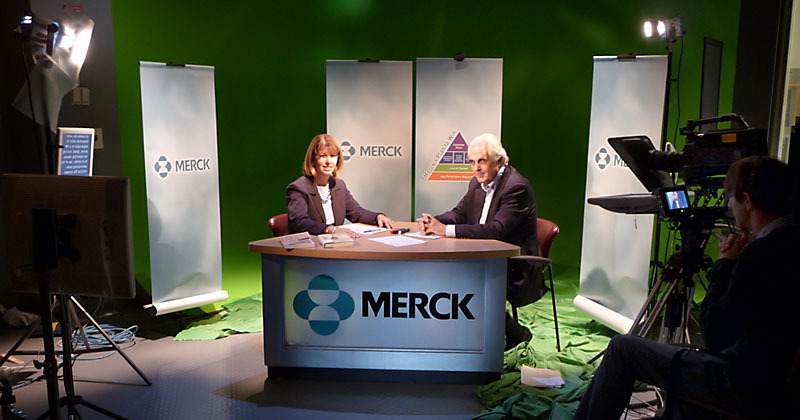 We wanted to hone down the look and really focus viewer’s attention on the man, his principles and the new direction Merck was striving to go. We didn’t want an overpowering set. Everything but the green background was brought in for this shoot. In fact, standing in the studio, you’d think it was cheap and uninspiring. But we all know it’s what the cameras see that is the real goal. 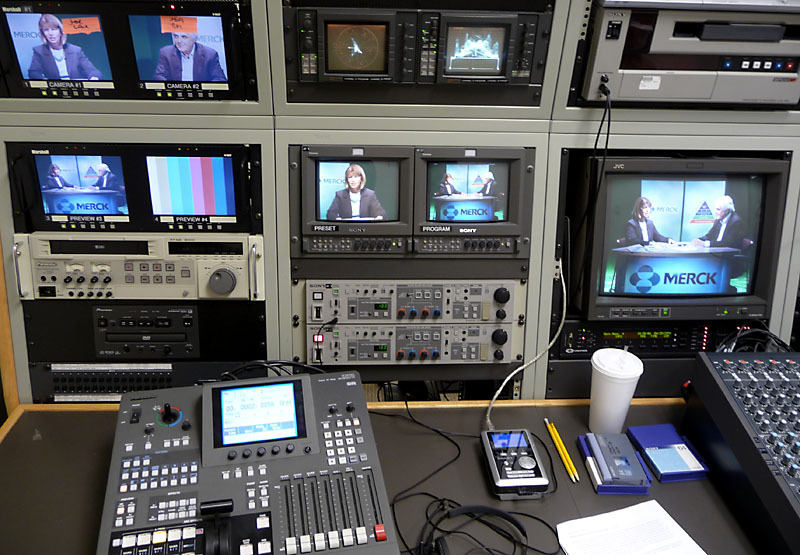 In the control room, we had three cameras to follow our interviewer, guest and an overall 2-shot for coverage. Scopes ensure proper exposure. Painted cameras perfect the shot. There was a lot of stop and go on this shoot because it was unscripted. There were prompters for opens and closes, and so the host could get in and out of breaks appropriately, but the actual meat of the interview was directly between our host and guest. This made the live-to-tape cutting more of a challenge. We also recorded this right to hard drive (Firestore) because the goal was to turn this project around within days and have a DVD trainers could start to review to incorporate these ideas and principles into new training. There was no waste of time or money here. DVD’s were burned in-house the very next day for distribution. And that’s how we get the word out post-haste!